On 1 April 1352 a document was sealed by the Bailiffs and Commonalty of Great Yarmouth granting a most peculiar gift to the Dean and Canons of Windsor. 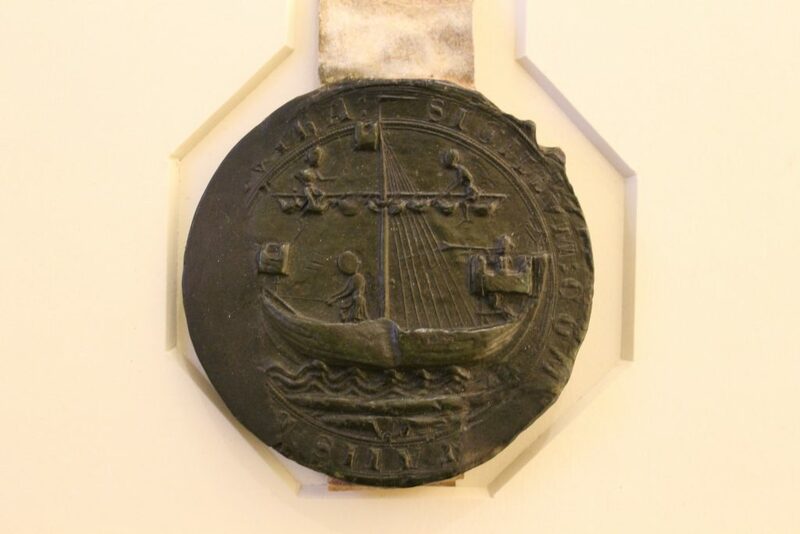 That document is still held in the Archives of St George’s Chapel [SGC XV.55.59], with its beautiful green wax seal depicting on one side a sailing ship. That seal is pictured here; it is one of the clearest impressions of a medieval ship surviving today. The gift in question was a last of red herrings – a last was measured as twenty wicker baskets full, which is between 10,000 and 13,200 fish! This was not a one-off gift but a promise to provide the fish every year on St Andrew’s Day (30 November). The herrings would be dried and well cleaned by the people of Great Yarmouth, but the Dean and Canons themselves had to bear the cost of bringing them to Windsor. The payment for transporting the herrings is recorded each year in the Treasurer’s account rolls, along with occasional details of incidents that occurred along the way. In 1362, for example, Richard Taylor was paid expenses for travelling to Yarmouth for the herrings and he received an additional sum in compensation because he had been robbed by thieves on the journey [SGC XV.34.2]. Twenty years later, a shipment of herrings on their way to Windsor by boat were mostly lost overboard. The Canon Treasurer estimated the value of the whole last at £4 13s 4d but recorded that only 40s worth had reached Windsor [SGC XV.53.64]. The idea of thousands of dried fish might be unappetising to us now, but there is evidence that they were an important food source for the Dean and Canons. On delivery to Windsor each winter they were divided into twelve portions – one for each of the canons. In 1377 they were mistakenly divided into eleven and one canon, William Dole, missed out on his share. The Dean and Canons were then forced to pay seven shillings for an additional cask of herrings so that Canon Dole could have his portion [SGC XV.34.14]. Seven shillings in 1377 is equivalent to over £200 today, so the value of the full last sent every year was considerable. The language of the original grant preserved in the Chapel Archives is extremely pious. It describes how the people of Yarmouth made the gift at the suggestion of King Edward III to demonstrate their devotion to the Dean and Canons of Windsor, to support the chapel in which the king himself had been baptised and to receive the Dean and Canons’ prayers in return. However, in the seventeenth century Canon George Evans produced a history of St George’s in which he suggested another possible reason for this gift. He alleged that it was commonly said that the annual payment had been imposed on Yarmouth as a fine for murdering a magistrate. Evans’s history is held in the Chapel Archives [SGC IV.B.16] but little more detail about the case is available. If it was punishment then the townspeople certainly repented for a long time: herrings were sent every year until 1718 when the Dean and Canons insisted that the quality of the fish was so poor that they wished to receive the fine in money instead. Great Yarmouth continued to pay an annual sum until 1867 when the Dean and Canons’ properties were taken over by the Ecclesiastical Commissioners. A total of 515 years of penance!